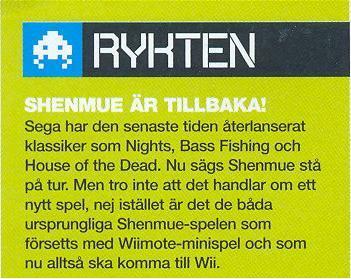 This snippet comes from Swedish gaming mag, Game Reactor. It was published in their ‘RUMORS’ section. I did a quick translation of the text to compare to the translation above, and it seems pretty spot-on. As I said, this is from ‘RUMORS’ section of the magazine. I hope this is the real deal…Shenmue never got the love it deserved. And you know what? I would love another game of Lucky Hit. Now if I could only find some sailors… Thanks to VideoGamer99 for the heads up!